The Camden market fire – disaster, or opportunity for positive change? WHILE the fire was devastating for those affected, it was much smaller than the general public, the press or any of us first suspected; and I don’t believe it was large enough to have a serious effect on Camden’s economy. We were all aware that area of Camden was going to change one way or the other but we didn’t need to see those buildings disappear. With luck, the traders will be swiftly rehoused and the buildings replaced by something fairly similar rather than modern constructions. Regeneration is a thorny subject for Camden in general: we must try our hardest not to throw the baby out with the bathwater. Camden needs to remain for Londoners and for Camdeners and it needs to be independent. Any redevelopment around the canal must mirror that essential encouragement of Camden’s independent trading markets based around fashion, bric-a-brac and music. It’s important the Hawley Arms is recreated and that we have good music venues and strong independent fashion – people coming out of our fashion colleges opposed to “I came to London and all I got was this T-shirt” fashion. The past two years have been incredibly positive. Police, council, local businesses and residents have come together and a common set of goals has become clear. Before anything else we had to sort out the high street through improved law and order; reducing vandalism, drug dealing and petty crime. Going forward, it is essential we keep what we have achieved so far in Camden’s regeneration at the forefront of our minds. One or two ingresses are cause for concern, like seeing chain shops sneaking up beyond Camden Tube. I think the high street between Camden Town and Mornington Crescent is easily big enough to accommodate all the chains local residents need to make their lives easier. But north of Camden Tube it is utterly imperative we maintain an independent, trader-based economy – it’s what we’re famous for. If anyone doubts that, I implore you to visit Covent Garden. It’s a tourist ghost town; a vision anyone who loves Camden would be horrified by, and that’s what will happen here if we’re not careful. It’s a natural British reaction to scream and shout when faced with change but the truth is the owners of the Stables and Lock markets have actually been excellent custodians for Camden. Lest we forget: they are the ones who created the market in the first place. Both the Stables Market and the Lock Market are exceptionally well run markets with no chains in sight. The Stables Market regeneration has not been popular, but people lose sight of the fact that building Gilgamesh paved the way for an extra 100 traders. The statistics are very simple: two years ago the market stood at about 390 independent traders; when the A&B building is finished it will be nearer 600. A lot of poppycock is spoken about Topshop and McDonald’s going in there – it will all be independent traders. If there was a criticism I’d say some of the architecture has not been particularly sensitive to Camden – or that interesting. My gut feeling is the planning process needs to be a bit stricter. Camden needs to maintain a certain look and it’s up to council, planning and press to keep a beady-eye on all planning applications. The consultation process often goes wrong so it’s important we keep an eye on each other. My nightmare vision is Inverness Street. Did we really need seven more stalls selling football shirts? That’s an example of how not to develop. 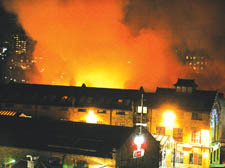 Has the fire made a substantial difference to the immediate future of Camden? Probably not. But I think it is an exceptionally good moment for us all to take stock and make sure that future development will be good for all Camden residents and Londoners alike. The fire could really be a positive force for us to pause, think, and make sure we all go forward on the right foot.